It has been a good week of a reading phase for me, finishing three books, all of which are really good books, especially this one, Rivers's retelling of the story of Mary, from the conception up to the ascension of Jesus. I was not too comfortable with Mary's over possessiveness of Jesus but after all it would be a struggle for a mere human to be the mother of the Son of God. She was also portrayed as being understandably impatient for the kingship and lordship of her son as the Messiah, to save Israel from the power of Roman rule. But what I found interesting was these two things. (1) Mary saw the difference between Jesus and her other children. Jesus was a perfect son, whilst his siblings were difficult to raise. Accounts of Jesus before he began his ministry is limited and it is interesting to know how perfect he would be as a son, a brother, a nephew, a worker, and a friend to others round him. There is nothing bad about him. Perfect and good. For once, "can't you just be like Jesus" will be a fair statement for Mary to utter to her other children! (2) Rivers suggested that the reason Jesus chose John, his disciple, to take care of Mary was because all her other sons and Jesus's disciples would be martyred. Only John lived to a ripe old age. So only he was able to care for Mary, a widow with no sons. 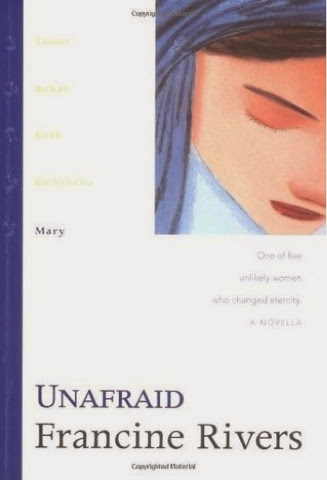 Unafraid may not be an easy read because one tends to speed read through the familiar parts, and I kept having to stop myself to read it slowly, but unsuccessfully. However, it is enlightening to see it through the eyes of Mary, albeit as mostly fiction.